Context: Nursing is a high-risk occupation, and intensive care units (ICUs) are one of the most sensitive hospital wards. Aim: This study aimed to determine the level of occupational hazards among nurses in the ICUs. Setting and Design: This descriptive-analytical study was conducted on a total of 281 nurses in the ICUs of tertiary care centers in Golestan and Mazandaran Universities of Medical Sciences in 2017. Materials and Methods: Data were collected using a five-dimensional occupational hazard questionnaire. Statistical Analysis Used: Data analysis was performed in SPSS software (version 16) and descriptive and inferential statistics were considered statistically significant (P < 0.05). Results: In this study, 75.1% of the nurses were female and 50.9% of the participants were within the age range of 26–35 years. The total mean and standard deviation of occupational hazards was 3.20 ± 0.66. In addition, the mean values and standard deviations of chemical, ergonomic, biological, psychosocial, and organizational, as well as physical hazards were reported to be 2.43 ± 1.06, 2.6 ± 0.82, 2.63 ± 0.91, 3.38 ± 0.7, and 3.38 ± 0.86, respectively. According to the results, significant differences were observed between occupational hazards and variables of gender, marital status, educational level, and work experience (P = 0.0001). Conclusion: Occupational hazard level was moderate among nurses in the ICUs, and most of the damages were related to the physical dimension. In addition to holding educational workshops in tertiary care centers by the related officials, proper preventive plans must be designed to reduce occupational injuries. According to Gallant–Roman, nursing is one of the hazardous occupations, in which the risks are four times higher than those in other professions. The dangers that threaten nurses include biological risks emerged from the exposure to infectious agents, risks of chemical contacts, physical dangers, ergonomic hazards, attacks and beatings, and negative effects of psychosocial and organizational factors. Wears recognized that the main cause of accidents was ergonomic problems and inappropriate equipment in a hospital in the UK. In Nigeria, Ofili et al. introduced four main reasons regarding hospital incidents, which were (1) the lack of access to appropriate protective equipment, (2) behavior of staff, (3) inadequacy of tools, and (4) excessive tendency toward high-speed performance. Based on Ghahremani et al., most of the hazards occurring for nurses were ergonomic hazards, such as skeletal and muscular disorders, and physical hazards, for instance, workplace poor ventilation and noise pollution. In a study carried out by Nikpoor, the highest frequency of hazards was related to skin contact with the blood and other body fluids. The protection of employees against the occupational hazards has been mentioned as a key principle by the World Labor Organization since 1919. The intensive care unit (ICU) is a special hospital ward, in which critically ill patients are provided with comprehensive, accurate, and ongoing care. Nurses in this section play an important role in patient care. On the other hand, the ICU is inherently stressful due to complexity, active nature, dynamism, and the type of hospitalized patients. In addition, the use of complicated technical equipment is one of the challenges in this ward and requires highly focused nurses to properly assess and provide appropriate and timely care for the patients. Therefore, these nurses are exposed to different occupational hazards. According to the literature, it is necessary and crucial to identify the hazards related to the ICU and recognize the appropriate strategies to prevent their occurrence in a way that nurse health is not affected., As a result, considering causes and types of occupational hazards in health-care organizations is a repeatedly mentioned necessity. With this background in mind, this study aimed to determine the level of occupational hazards for nurses in the ICUs. This descriptive-analytical study was conducted on a total of 281 nurses working in the tertiary care centers in Golestan and Mazandaran Universities of Medical Sciences in Golestan and Mazandaran, Iran. The centers included 21 ICUs, which were burn, trauma, internal, general, and coronary care units. The participants were selected through stratified random sampling; in this regard, each tertiary care center was first considered as a group. Then, the desired number of the participants was randomly chosen from each group proportional to the total number of nursing personnel. The sample size was estimated based on a study conducted by Arab et al. In this respect, the mean value and standard deviation of occupational hazards were reported as 2.0 ± 87.55 with the confidence interval of 95% and accuracy of 0.1. Based on the following equation, the minimum sample size was calculated as 117 and considering the necessity of participant stratified random sampling using correction factor equal to 2 and a 10% attrition, a total of 281 nurses were selected for the present study. The inclusion criteria were the employment in the ICU of one of the tertiary care centers at the time of the study, a minimum degree of BSc in nursing, minimum work experience of 3 months in an ICU, and no diagnosed physical and mental problems. The exclusion criteria were the lack of willingness to participate in the project and incomplete questionnaires. Data were collected using the occupational hazards questionnaire designed by Arab et al. in 2015. The first part of the questionnaire included 14 items regarding the demographic and occupational characteristics. The second part contained 58 items scored based on a five-point Likert scale in five domains, which were physical (nine items), biological (six items), chemical (six items), ergonomic (eight items), psychological, organizational, and social hazards (29 items). The score of each dimension and total score were reported as mean and standard deviation. To facilitate the data analysis process, the scores were classified into three equal parts by coin toss and divided from 1 to 2.33 at low level of hazards, 2.34–3.66 at moderate level of hazards, and 3.67–5 at high level of hazards. The reliability and validity of the questionnaire have been confirmed by Arab et al. In the present study, the content validity of the questionnaire was confirmed by ten faculty members and authorities in the field. The test–retest method was applied regarding the determination of the research tool reliability. The questionnaires were distributed and collected among 20 participants twice with an interval of 10 days. The correlation between the score of the first and second times was estimated using Spearman's correlation coefficient (r = 0.78). With prearranged coordination, the author referred to the tertiary care centers and randomly selected the desired number of the nurses from the name list in the ICUs proportional to the total number of nursing staff in that hospital. First, the author introduced himself and explained the study objectives. In addition, oral consent from the nurses was obtained before entering into the study, and the participants were provided with the questionnaires during rest time. Data analysis was performed in SPSS software (version 16, SPSS 16.0 Student Version for Windows Inc. SPSS©2009) using descriptive (i.e., mean, standard deviation, and frequency) and inferential (i.e., Chi-square test, t-test, and analysis of variance) statistics with the confidence interval of 95%. The present study was approved by the Regional Ethics Committee in Medical Studies of Golestan (code: IR.GOUMS.REC.1396.63) and Mazandaran University of Medical Sciences and received the necessary licenses from the Deputy of Research and authorities of the research context. In addition, the participants were assured of the confidentiality terms regarding their personal information. Moreover, the participants were allowed to withdraw from the project at any time. In this study, 24.9% and 75.1% of the participants were male and female, respectively. In addition, 50.9% of the participants were within the age range of 26–35 years [other demographic characteristics are shown in [Table 1]. According to the results of the Chi-square test, no significant difference was observed between the scores of occupational hazards in Golestan and Mazandaran Provinces [Table 2]. [Table 3] tabulates the comparison of mean values of occupational hazards with demographic characteristics of nurses in the ICUs. According to the results of the present study, the level of occupational injuries for the nurses in the ICUs was moderate. In this regard, Mahmoudi et al. reported the incidence rate of occupational damages caused by sharp wastes in emergency departments and the ICUs to be high (67.9%) and moderate (37.5%), respectively. Similarly, Arab et al. noticed that the level of occupational injuries among nurses in the emergency department is moderate, which is in line with the results of the present study and may be due to the sensitivity of emergency departments and the ICUs. Furthermore, Ghahremani et al. reported that the level of occupational hazards among health-care staff in the hospital to be moderate. However, Juibari et al. marked that the level of occupational damages among nurses was low, which is inconsistent with the findings of this study and may be due to the different types of participants in other hospital wards. In general, the type of hospitalized patients and high level of stress in the ICUs, compared to those in other hospital wards, lead to increased stress and the fatigue level of nurses, resulting in reduced concentration, the increased risk of hurriedness, and decreased precision. All these conditions can affect the risk of damages in the ICUs. In the present study, the highest level of occupational damages was related to physical hazards. The results of a study carried out by Nekoi Moghaddam et al. demonstrated that the frequency of physical damages for nurses was 95%. In addition, Orme et al. reported that the ergonomic hazards, particularly muscle pains, were the most frequent occupational hazards. Moreover, Fabunmi et al. reported that the incidence rate of physical hazards among nurses was about 90.7%. In a study conducted by Shimizu et al., the highest physical risk for nurses and nursing technicians was due to energy consumption and inappropriate body movements while performing responsibilities. Nonetheless, Arab et al. mentioned that the psychosocial and organizational hazards had the highest mean values of occupational damages, which is not in line with the findings of the present study. This lack of consistency between the results might be due to the location of the project in a study performed by Arab et al. ; since the nurses were selected from the ICU, where they deal with the violent behaviors of clients and heavy workload and high-stress level, which can affect the psychosocial and organizational hazards related to nursing. In the present study, the lowest occupational hazards were reported chemical hazards. 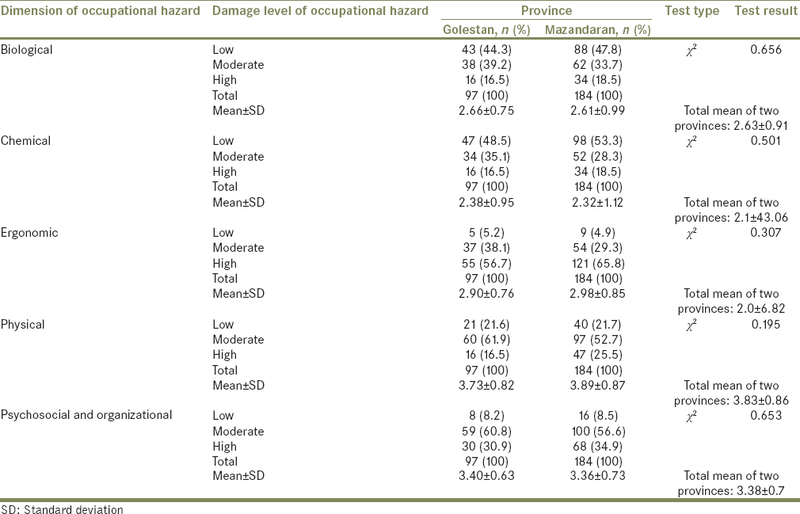 In a study carried out by Arab et al., chemical hazards had the lowest mean value of occupational damages, which is in accordance with the results of the present study. On the other hand, Mbaisi et al. marked that half of the nurses had skin damages. In a systematic review conducted by Bousquet et al., the allergy prevalence to the latex was reported as 4.32% and had a significant relationship with hand dermatitis and asthma. Most of the nurses reported the high levels of ergonomic damages. In the study performed by Arab et al., the ergonomic hazards (i.e., excessive standing to perform activities related to occupational tasks and wrong physical postures during tasks) were the most important occupational risks. Furthermore, in a study carried out by Aghakhani et al., this risk was reported to be 41.7%. Ghahremani et al. reported that the most important occupational hazards were related to ergonomic hazards, which are in line with the findings of this study. In a systematic review performed by Yassi and Lockhart, nursing activities had the high level of risks, and there was adequate evidence regarding a link between nursing duties and ergonomic hazards such as spinal disorders. In total, 50% of the nurses were reported with the low levels of damages considering biological hazards. In the study conducted by Ghahremani et al., the biological hazards were at the third level of occupational hazards among nurses. According to the results of a study performed by Zeighami et al., the risk of needle injuries in emergency wards was three times higher than that in other wards. Tabatabaee et al. reported that the highest occupational hazards were biological risks, such as skin contact with blood and other body fluids. In addition, Aghakhani et al. demonstrated that the biological hazards, especially skin contact with blood or other body fluids, had the highest score among occupational hazards among nurses, which is not in line with the findings of this study and might be due to the different questionnaires and study participants (in addition to nurses, the personnel of other hospital wards, including radiotherapy, laboratory sciences, and physiotherapy, participated in the study). Based on the results of the present study, it was indicated that psychosocial and organizational risks were at a moderate level. In a study carried out by Badrizadeh et al., organizational risks were reported as 53.8%. Lambert et al. showed that nursing was ranked 27th out of 130 professions, in which it is needed to be referred to a psychologist regarding mental health problems. The results of this study revealed that the level of occupational hazards in male, married, and graduate nurses with a high work experience was lower, compared to that in other nurses. In a study conducted by Arab et al., there was a significant relationship between the level of occupational hazards with work experience, educational level, employment status, and the training course. Based on the results of a study performed by Tabatabaee et al., the level of occupational hazards demonstrated a significant association with gender, work experience, employment type, marital status, and hospital type. In the study carried out by Nekoi Moghaddam et al., it was revealed that gender, educational level, and work experience had a significant relationship with the level of occupational hazards. Moreover, in the study performed by Ghahremani et al., a significant relationship was observed between gender and marital status with occupational hazards among nurses. One of the major limitations of this study was sample selection from limited wards and concentration only on the ICUs, which restricted the generalizability of the results to other wards in other hospitals. Another limitation was the lack of using more valid clinical assessment methods such as interviews. It is suggested that future studies should be conducted to evaluate and compare occupational hazards in all wards among all hospital staffs. According to the results of the present study, the level of occupational damages was at a moderate level among nurses in the ICUs. It seems that in-service trainings, using proper human resources proportional to the volume of activity, providing safety and security equipment, monitoring standard precautions by the authorities, as well as the proper planning regarding working hours and right profession designing, can be considered as solutions to reduce occupational hazards. However, it should be noted that recording these hazards by head nurses of the wards and nurses themselves, as well as holding workshops to share experiences and discuss relevant issues, can be effective strategies to recognize the sources of these hazards and prevent the occurrence. This study was financially supported by the Research Deputy of Golestan University of Medical Sciences, Golestan, Iran. This article was extracted from a thesis submitted in partial fulfillment of the requirement for a master degree in critical care nursing approved by the Nursing Research Center. The authors would like to thank the Deputy of Research and Technology of Golestan University of Medical Sciences for the financial support of the project and Mazandaran University of Medical Sciences and nurses in the ICUs for their cooperation with this study. Gallant-Roman MA. Strategies and tools to reduce workplace violence. AAOHN J 2008;56:449-54. Walton AL, Rogers B. Workplace hazards faced by nursing assistants in the United States: A focused literature review. Int J Environ Res Public Health 2017;14. pii: E544. Wears RL, Woloshynowych M, Brown R, Vincent CA. Reflective analysis of safety research in the hospital accident & emergency departments. Appl Ergon 2010;41:695-700. Ofili AN, Asuzu MC, Okojie OH. Hospital workers' opinions on the predisposing factors to blood-related work accidents in central hospital, Benin city, Edo state, Nigeria. Public Health 2003;117:333-8. Ghahremani E, Parandeh P, Vafadar Z, Ebadi A. Survey of the occupational hazards and related factors in health care workers in military hospitals during 2016-2017. J Mil Med 2018;20:56-64. Nikpoor B. Survey of Nurses Occupational Hazards in Zanjan Hospitals. [Thesis in Persian], Qazvin University of Medical Sciences; 2005. Tierney LT, Conroy KM. Optimal occupancy in the ICU: A literature review. Aust Crit Care 2014;27:77-84. Lai HL, Lin YP, Chang HK, Wang SC, Liu YL, Lee HC, et al. Intensive care unit staff nurses: Predicting factors for career decisions. J Clin Nurs 2008;17:1886-96. El-Molla MA. Developing and validating proposed occupational risk management standards at critical care units. J Am Sci 2013;9:157-164. Shimizu HE, Couto DT, Merchan-Hamann E. Pleasure and suffering in intensive care unit nursing staff. Rev Lat Am Enferm 2011;19:565-72. Shimizu HE, Couto DT, Merchán-Hamann E, Branco AB. Occupational health hazards in ICU nursing staff. Nurs Res Pract 2010;2010:849169. Arab M, Hoseini M, Panahi M, Khalili Z. Nursing occupational hazards of the emergency department in teaching hospitals affiliated to Tehran University of medical sciences. J Hosp 2015;14:35-48. Mahmoudi N, Sepandi M, Masoumbeigi H. The prevalence of injuries by sharp waste in nurses of emergency and critical care wards in one of the military hospitals in Tehran. Health Res J 2015;1:7-13. Juibari L, Sanagu A, Farrokhi N. The relationship between knowledge of ergonomic science and the occupational health among nursing staff affiliated to Golestan University of medical sciences. Iran J Nurs Midwifery Res 2010;15:185-9. Nekoi Moghaddam M, Amir Esmaili MR, Mirshahi F, Sefidbar N, Sharifi T, Ghorbani R, et al. The rate of occupational hazards and the effective factors in nurses of selected hospitals of Kerman in 2011. J Health Dev 2013;2:235-49. Orme NM, Rihal CS, Gulati R, Holmes DR Jr., Lennon RJ, Lewis BR, et al. Occupational health hazards of working in the interventional laboratory: A multisite case control study of physicians and allied staff. J Am Coll Cardiol 2015;65:820-6. Fabunmi AA, Oworu JO, Odunaiya NA. Prevalence of musculoskeletal disorders among nurses in university college hospital, Ibadan. West Afr J Nurs 2008;19:21-5. Mbaisi EM, Ng'ang'a Z, Wanzala P, Omolo J. Prevalence and factors associated with percutaneous injuries and splash exposures among health-care workers in a provincial hospital, Kenya, 2010. Pan Afr Med J 2013;14:10. Bousquet J, Flahault A, Vandenplas O, Ameille J, Duron JJ, Pecquet C, et al. Natural rubber latex allergy among health care workers: A systematic review of the evidence. J Allergy Clin Immunol 2006;118:447-54. Aghakhani N, Cheraghi R, Alinejad V, Baghaei R. Prevalence and factors of occupational accidents in nurses of educational and treatment centers of Urmia University of medical sciences, Urmia, 2016. J Urmia Nurs Midwifery Fac 2017;15:270-80. Yassi A, Lockhart K. Work-relatedness of low back pain in nursing personnel: A systematic review. Int J Occup Environ Health 2013;19:223-44. Zeighami R, Azimian J, Haghi M, Kaboodi B, Bijani B. A comparison between the risk of needlestick injuries among nurses in emergency wards and nurses in other wards of hospitals. Mod Care J 2014;10:272-8. Tabatabaee S, Afroozi M, Nejatzadegan Z, Asadi M, Goharimehr M, Kalhor R, et al. The analysis of occupational hazards and their etiology among the employees of teaching hospital of Qazvin University of medical sciences. Iran Occup Health 2014;11:35-44. Badrizadeh A, Farhadi A, Tarrahi MJ, Saki M, Beiranvand G. Mental health status of the nurses working in Khorramabad state hospitals. Yafte 2013;15:62-9. Lambert VA, Lambert CE, Petrini M, Li XM, Zhang YJ. Workplace and personal factors associated with physical and mental health in hospital nurses in China. Nurs Health Sci 2007;9:120-6.